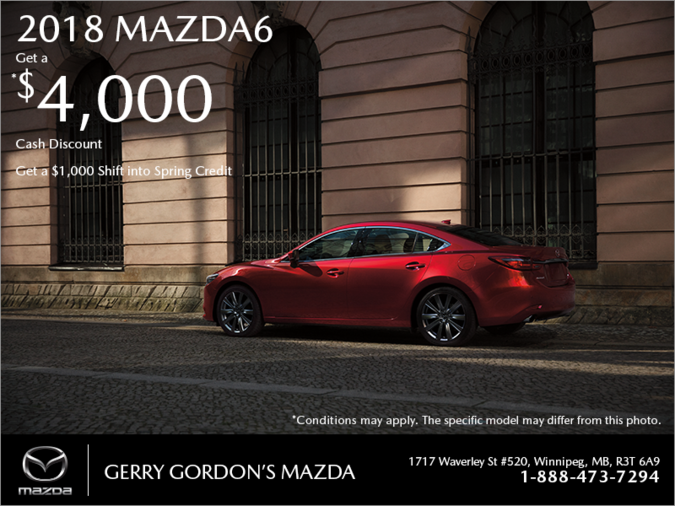 Gerry Gordon's Mazda | Get the 2018 Mazda6 today! Home > Special Offers > Sales > Get the 2018 Mazda6 today! Get the 2018 Mazda6 today! Purchase the 2018 Mazda6 and get up to a $4,000 cash discount. This offer includes a $1,000 Shift into Spring credit. Some conditions apply. This offer ends on April 30th, 2019. Hurry up and book your test drive today! †Cash purchase discount for all new 2018 Mazda6/2018 MX-5/2018 MX-5 RF models is $4,000 including a $1,000 Shift into Spring Credit/$4,000/$5,000 including a $1,000 Shift into Spring Credit and cannot be combined with other offers, including lease and financing offers. I wish to receive recalls, news and promotional emails from Gerry Gordon's Mazda.